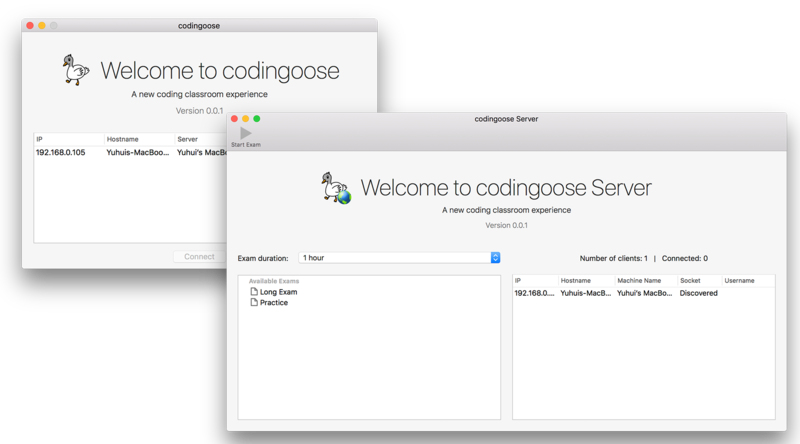 Codingoose is an in-class coding challenge system created with Swift, utilizing socket for server/client communications and featuring an integrated C++ judge built from ground up. Winner of Apple Canada & BCSSA Learning Technology Scholarship! A calendar and timetable app designed by Yuhui Li exclusively for schools with linear day 1 day 2 schedule. It allows user to set up the calendar with day 1's and day 2's (as well as special days), and then set up unique schedule for each type of days. Besides special days feature, which allows user to add days such as Collaboration Days, iChronotable has built-in special courses feature. Whether it is a once a week course, or just one time class, you could write in the data and the app would present your schedule to you with the special course included. Further, iChronotable has homework recording feature. The integrated courses lists created for each day allows fast input of homework. The flexible notification system allows the user to choose when he or she wants to be notified about the due date. In summer 2014 at Stanford, I designed this player for the interest of recreating the design of the original Macintosh 128K. It was merely for collection purpose. I won't be able to buy one anymore, so why shouldn't I make one myself? This Arduino-powered bluetooth music player resides inside a carefully crafted 3D printed enclosure. User interaction is enabled through the 4.3-inch touchscreen. After the summer at Stanford, I continued with this project by adding a glowing logo and optimizing the backboard connectors.